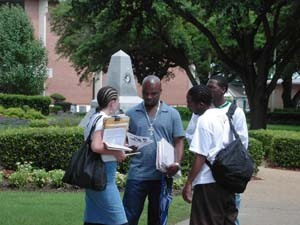 SWP campaign supporters petition June 17 at Jackson State University in Jackson, Mississippi, for ballot spot. The state certified SWP ticket on ballot September 7. JACKSON, MississippiThe Mississippi State Board of Election voted on the morning of September 7 to place the Socialist Workers presidential ticket on the states ballot. The socialist candidates will appear along with those of the Democratic, Republican, Libertarian, Green, Reform, and Constitution parties. Sandler also noted that the same day state officials said that the SWP ticket has been placed on the ballot in Louisiana too. The victory in Mississippi came after three months of campaigning by supporters of the SWP ticket of Róger Calero for president and Arrin Hawkins for vice president in this southern state. It marks another step in the successful nationwide effort to get the working-class alternative to the parties of capitalism on the ballot in the most states since 1992. Since June, supporters of Calero and Hawkins from Mississippi and surrounding states worked to bring this to fruition. In June and early July, volunteers petitioned in Jackson, Meridian, Natchez, Pascagoula, and Tchula to gather nearly 2,200 signatures for the socialist candidates. They campaigned at shopping centers in working-class communities, at Jackson State University, at meetings of farmers, in the Delta, and elsewhere. Workers, farmers, and young people took a serious look at the socialist candidates and what their party stands and fights for and many liked what they heard. Even more agreed with the socialists right to be on the ballot. After completing the necessary paperwork, signatures were submitted to the individual counties for validation. Toward the end of July, officials from Hinds County, which includes the state capital Jackson, notified the socialist campaign they had validated only 231 of the 843 signatures the socialists had collected there. Supporters of the SWP campaign challenged that decision. After a visit to the Hinds County clerks office July 28, the socialists quickly uncovered evidence that at least 200 signatures had been declared invalid for no good reason. The county clerk changed the previous ruling on the spot, certifying 435 signatures. (See SWP certified on Iowa ballot, confronts Mississippi challenge in August 10 Militant.) That put the total over the state requirement. Registrars from 27 counties certified 1,028 signatures valid, over the 1,000 registered voters required by the state. These signatures were then filed with the Secretary of State in Jackson on August 2. Arrin Hawkins, who was in Mississippi that week for a campaign tour that took her to Tchula and Jackson, was present during the filing. The seven electorsone more than the six requiredfor the socialist ticket include two farmers from Tchula, a small town in the Mississippi Delta; a Steelworkers union member from Natchez; and three workers who took part in an earlier strike at the Freshwater Farms catfish plant in Belzoni. Socialist campaigners faced another major challenge on the road to the September 7 victory. In early August, an article by Barbara Harris peddling a red-baiting smear against the SWP campaign appeared in the Jackson Advocate, a weekly newspaper published in Jackson aimed at the Black community. Titled Vulnerable Voters Deceived by Socialist Workers Candidate, the article tried to smear the campaign and block readers from giving the socialists platform serious consideration. In an interview, Sandler said the tactic of trying to use the prestige of the civil rights movement to back red-baiting slanders is not new in ruling-class attacks on working-class parties. The letter to the editor by four supporters of the SWP campaign from Tchula responding to the slanders in the Harris article, which the Advocate has not published either so far, is another good refutation of these smears, he added (see letter printed in this issue). These attacks notwithstanding, the Mississippi elections commission agreed that the socialists had met all the requirements and put the SWP ticket on the ballot. Mississippi election law requires presidential and vice-presidential candidates meet the constitutional requirements of being at least 35 years old and a U.S.-born citizen. Because Calero is a permanent resident and Hawkins is under 35 years of age, the names of James Harris and Margaret Trowe will appear on the ballot in their place. Harris and Trowe were the Socialist Workers presidential ticket in 2000. They will be designated independent on the printed ballot. Supporters of Calero and Hawkins are looking forward to campaigning in Mississippi through the November 2 elections and beyond, Sandler said. 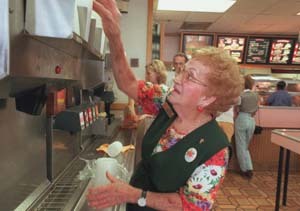 Lena Rodríguez, a retiree, works part-time at a Burger King restaurant in Tampa, Florida. More people are working past the retirement age to make ends meet. Latest proposals by White House will undercut Social Security. Coming out of the Republican National Convention, President George Bush has been campaigning around some of the key domestic policies his administration would push for in a second term. He has called for making previous income tax cuts permanent, establishing individual health savings accounts, andin the name of strengthening Social Securitythe creation of private retirement accounts. This package of measures is billed as a way for working people to become ownersto have savings, investments, and propertyas protection in face of economic uncertainty. In reality, the proposals for individual retirement and health-care accounts are part of preparing the way for a stepped-up offensive by Democrats and Republicans against Social Security, Medicare, and other social conquests of working people. The Republican candidates are also campaigning around the gains U.S. imperialism has made in shifting its military strategy to be able to wage wars to defend its interests around the world under the banner of the war on terrorism. They contrast this with the previous decade, the years of the post-Cold War peace dividend, when Washington scaled back military spending and had not yet adjusted to the perspective that were faced with a new enemy and we need a… fundamental redesign of our national security strategy, as Vice President Richard Cheney put it in a September 3 speech. Bush pulled ahead of Democrat John Kerry in the polls following the Republican convention. A Newsweek post-convention poll put him 11 points ahead of Kerry54 percent to 43 percent. This followed virulent attacks on Kerry at the Republican National Convention. Some speakers, especially Sen. Zell Miller, a conservative Democrat, questioned Kerrys ability to act as commander-in-chief. Kerry has so far tried to say as little as possible about his proposals on Social Security, promising that, if elected, he would not cut benefits for current Social Security recipients. That is also Bushs position. At the heart of these proposals is Social Security reform, which, under the pretext that the growing number of retired workers will bankrupt the Social Security system in the coming decades, is aimed at undermining its character as a social right for all. The president also claimed credit for having strengthened Medicare. In the guise of offering coverage for prescription drugs, however, the bipartisan Medicare prescription drug law adopted by Congress and signed by Bush last year shifts more of the burden for retirees health care onto retired workers themselves, forcing them to rely more heavily on private health-care companies, and introducing means testing. On September 3, federal officials announced that Medicare premiums, the monthly expense paid by elderly and disabled patients for routine care, will be hiked by 17 percent. The administrator of Medicare, Dr. Mark McClellan, acknowledged that part of this increase results from the billions of dollars Medicare is paying insurers to encourage them to offer private plans, the New York Times reported September 4. As part of his package of proposals, Bush is also advocating tax-free health savings accounts to provide medical insurance based on individual coverage rather than employer-sponsored plans. Workers would receive tax credits for putting savings in these accounts. Employer contributions into these individual accounts would be possible if workers signed up for the companys health plan, which would likely require large deductions from their paychecks. Workers would supposedly be able to keep this individual health plan even if they changed jobs. This is a major selling point, because working people who switch employers often lose their insurance or end up with worse coverage. And even if they stay at the same company, they have no guarantee they will receive a pension or health-care benefits, as in the case of Horizon Natural Resources, United Airlines, and other major companies where workers face the loss of their pensions after the bosses declare bankruptcy. Noting that more than half of the uninsured are small business employees, the president advocated allowing small companies to join together to purchase insurance at the discounts available to big companies. Nearly 82 million people in the United Statesone out of three under the age of 65lacked health insurance at some point in 2002-2003. Bush highlighted his call for making permanent the tax cuts instituted over the past few years, as a way to allow people to save money for the future. He coupled this proposal with a pledge to reform the federal tax code in the name of simplifying it and promoting economic growth. Capitalist politicians and commentators seized on remarks by Federal Reserve chief Alan Greenspan to step up the push for Social Security reform. Reiterating comments he made earlier this year, Greenspan said August 27 that the country will face abrupt and painful choices if Congress does not move rapidly to reduce Social Security and Medicare benefits because of the growing numbers of workers who are approaching retirement. The Fed chief has made two proposals to recalibrate Social Security. One is to raise the retirement age, which now ranges from 65, for those born before 1938, to 67 for those born after 1959. The second change is to cut benefits for future retirees. A third measure, not ruled out by Greenspan, is to increase Social Security payroll taxes or to raise taxes on benefits. Greenspan suggested beginning this reform by cutting the annual cost-of-living adjustment that Social Security beneficiaries receive. Former Social Security Commissioner Robert Ball has proposed beginning with a raise in payroll taxes on higher-paid employees; if such a measure passes, of course, it may be used to pave the way for taxing the benefits of lower-paid workers next. Liberal economists Peter Diamond of the Massachusetts Institute of Technology and Peter Orszag from the Brookings Institute have advocated both increasing taxes and gradually reducing Social Security benefits to compensate for longer life spans. Kerry has been silent on the heart of Bushs proposals, saying only he will not cut benefits for current Social Security recipients, which is also the presidents position. Both Kerry and Bush, however, have avoided taking a position on proposals by Greenspan and others to cut benefits for future retirees, which is what the real debate has focused on. Working people won the concessions contained in the Social Security Actincluding guaranteed pension, disability, and unemployment benefits, as well as Aid to Families with Dependent Childrenthrough hard-fought battles in the 1930s. Through the civil rights struggles of the 1950s and 60s these gains were extended with Medicare, Medicaid, food stamps, and cost-of-living protectionsthat is, automatic adjustment of benefits to make up for inflation. They have become part of the basic living standards of working people. A frontal assault on these gains would carry a big political cost. In 1982-83, for example, the Reagan administration established a bipartisan commission, headed by Greenspan, to consider proposals for reforming Social Security. The administration decided that it was politically too risky to touch the program at the time, however. The commissions proposal to raise the age for full retirement benefits from 65 to 67 was not implemented until two decades later. Subsequent social security reform commissions, like Clintons Commission on Entitlement and Tax Reform and the one appointed by Bush in 2001, co-chaired by former Democratic senator Patrick Moynihan, have also been bipartisan. The opening salvo was launched by the Clinton administration, which in 1996 dismantled an easier target: the federal welfare program known as Aid to Families with Dependent Children. There was virtually no opposition to this move by the unions and civil rights organizations, which supported the Clinton administration. As a result, the U.S. rulers are now training their guns on Social Security and Medicare, with the current debate opening the way for the attacks that the next administration, whether under Bush or Kerry, will carry out. Cheney rattled off a series of attacks on U.S. targets that took place during the two decades before the Sept. 11, 2001, attacks. He cited the 1983 car-bombing of the U.S. military barracks in Beirut in which 241 Marines were killed, the 1996 attack on Khobar Towers in Saudi Arabia, and the attack on the USS Cole in Yemen in 2000, among others. In an earlier speech, given August 6 in East Grand Forks, Minnesota, Cheney elaborated, In Beirut in 1983, after the Marine barracks were struck, within a matter of months we were totally out of Lebanon. In 1993, after they ambushed some of our troops in Mogadishu, we lost 19 soldiers, within a matter of weeks we were out of Somalia altogether. The first incident took place under the Reagan administration, the second during the Clinton presidency. Now, under the Bush administration, that day is gone. Its over with, Cheney said in St. Paul. In his acceptance speech Bush highlighted the progress the U.S. rulers have made in the global war on terror since the U.S.-led invasions of Afghanistan and Iraq. In those two countries, he noted, regimes favorable to U.S. interests have been established, and other governments in the region have gotten the message and are more responsive to U.S. demands. Pakistan is capturing terrorist leaders, Saudi Arabia is making raids and arrests, Libya is dismantling its weapons programs, he said. Taking a mainstream Republican stance, Bush mentioned the question of abortion only in passing, saying that we must make a place for the unborn child. Similarly, he spoke of his support for the union of a man and a woman and the Defense of Marriage Act passed by the Clinton administration as a bipartisan position, omitting mention of the campaign by conservative Republicans for a constitutional amendment barring gay marriage. For his part, Kerry has continued to argue that he would be a more effective war president than Bush. Since Bush has already been carrying out such a course for four years without running into a major quagmire, the majority of public opinion has tended to back the current commander-in-chief. Kerry has largely been reduced to raising minor tactical disagreements with the administrations foreign policy and dwelling on his days as an officer in the Vietnam War three decades ago. Since the Republican convention, Kerry has reiterated his campaign theme that the Bush administration is responsible for the loss of jobs in the United States over the past three and a half years. The latest government reports, however, indicated that employers added 144,000 jobs in August and that the official jobless rate dipped slightly to 5.4 percent, its lowest level since the 2001 recession. While working people still face a decline in real wages, several million out of work, and worsening conditions on the job, the Bush administration has been able to take advantage of the current upturn in the business cycle. Under these conditions, given the lack of an alternative presented by the Democratic campaign, it is not surprising that Kerry, who had been running neck and neck with Bush in the polls, has now slipped behind the incumbent. Some New York Times columnists and other pro-Kerry voices are already analyzing the lessons of past Democratic defeats and adopting a tone that anticipates a Republican victory in November.